The operation is usually done using keyhole surgery. During a keyhole operation, your surgeon uses small instruments, guided by a special telescope with a camera. If you're very overweight or have had surgery to your abdomen before, then your surgeon may recommend having an open operation, which is done through a single, larger incision. Using surgical staples, your surgeon will make a pouch out of the top of your stomach, separating it from the lower part of your stomach. Your surgeon will make an opening in the pouch and connect it to a section of your small intestine. This means the food you eat will bypass your old stomach and the first part of your intestine. The length of small intestine that the operation bypasses can be adjusted to make sure that when you reach the right weight for your height, you will be able to eat enough to maintain that weight. Your surgeon may insert a drain, to help remove any fluid or blood that might have collected inside your abdomen. A team of health professionals usually including a doctor, dietitian, psychologist and surgeon evaluate whether gastric bypass or one of the other forms of weight-loss surgery is appropriate for you. Your psychological status. Certain mental health conditions may contribute to obesity or make it more difficult for you to maintain the health benefits of gastric bypass surgery. Your age. Although there's no specific age limit for gastric bypass surgery, the risks increase as you get older. 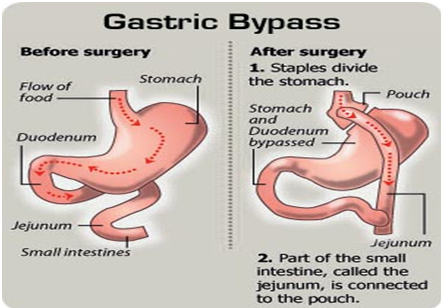 A gastric bypass operation is performed under general anesthesia. You may be asked to wear compression stockings to help prevent blood clots forming in the veins in your legs. You may also be given an injection of an anticlotting medicine called heparin. You will only be able to eat small amounts at each meal. To start with, stick to liquids, and then move onto pured food. 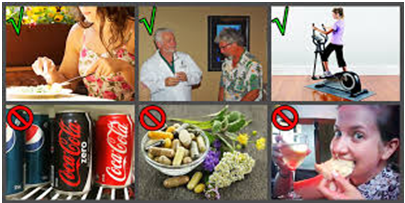 You may also need to take vitamin and mineral supplements. Your surgeon and dietician will give you all the information you need about what foods to eat and how much. 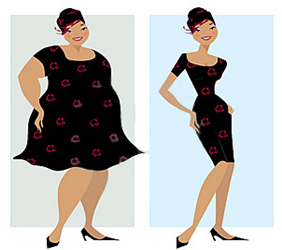 It usually takes between four and six weeks to make a full recovery from a gastric bypass operation. However, this varies between individuals, so it's important to follow your surgeon's advice. Side-effects are the unwanted but mostly temporary affects you may get after having the procedure. You're likely to have some bruising, pain and swelling of the skin around your wounds. You may feel sick or vomit after eating, because the amount you're able to eat is a lot less than before the operation. This should get better as you change your eating habits. If you eat too many sugary foods, you can get an unpleasant sensation called dumping. It can make you feel sick or faint, or give you abdominal pain and diarrhea. Your temperature is above 100&#x2109; for more than 4 hours. Complications specific to a gastric bypass operation are listed below. An infection in your wound or a chest infection. A blood clot in your lung (pulmonary embolism). A leak at the place where your intestine is re-joined to your stomach. This can be very serious and you will usually have an operation to repair it straight away. The opening from your stomach into your intestine can become narrowed, which makes it more difficult for food to pass through it. A lack of protein, vitamins and minerals caused by the change in the amount and type of food you're able to eat after the operation. This can affect your general health. If you lose weight quickly, you may develop gallstones. These can be painful and you may need surgery to remove them. For more info on exercise, please check below video. 9. Restrict fiber rich foods such as fruits and vegetables for the Stages I and II. - 1Cup well-cooked and pureed vegetables (carrots, beans, cauliflower, pumpkin) OR paneer mixed with pureed peas.